The 233-acre Puakō Petroglyph Archaeological District contains more than 3,000 separate ki'i pōhaku (petroglyph) designs. It is one of the largest concentrations of rock art in the entire Hawaiian island chain. Nearly 1200 petroglyphs are visible from the trail. This short trail travels inland from Holoholokai Beach Park on the Malama Trail. It might be a good idea to visit this area in the early morning or late afternoon to avoid the hot mid-day temperatures and to also have better light to view the petroglyphs. The Archaeological District is open every day from 6:30am to 6:30pm. Trailhead: On Hwy. 19 north of Kailua-Kona and south of Kawaihae, look for the entrance to the Mauna Lani resort between mile markers 73 and 74 (Mauna Lani Drive). Follow Mauna Lani Drive to a traffic circle and take your first right onto North Kaniku Drive. Follow North Kaniku Dr. as it approaches the Fairmont Orchid hotel. Just before entering the hotel grounds, turn right onto Holoholokai Beach Park Road. Travel to the end of the road and find public parking. There are no services at the trailhead, but Holoholokai Beach Park has restrooms, showers, grills, and picnic tables. Hike: Walk to the east side of the parking lot and find the beginning of the Malama Trail. The beginning of the trail is paved. You will quickly pass an area with replica reproductions of some of the more impressive petroglyphs. While it is never appropriate to touch real petroglyphs, it is perfectly fine to touch these replicas. Some people bring pencil and paper to create rubbings. 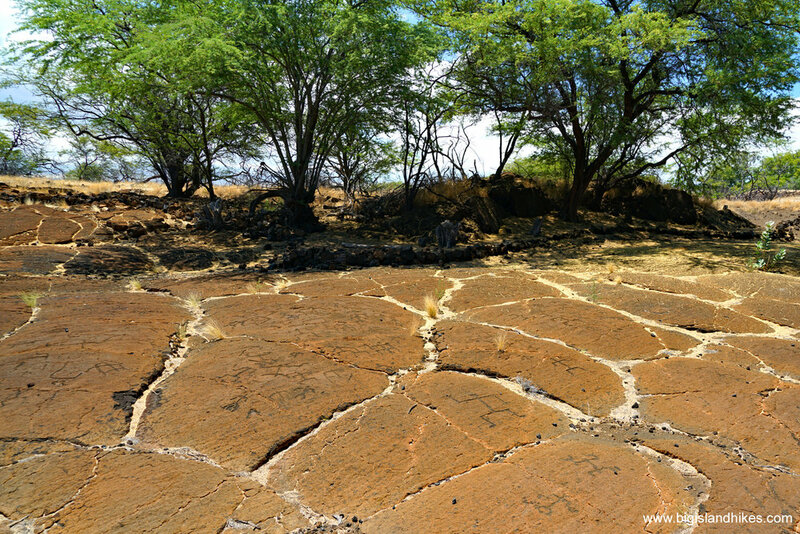 Past the replica petroglyph area, the trail becomes rough and enters an inland Kiawe forest. Kiawe is an invasive species from South America with incredibly sharp and strong thorns. Look sharp on the right side of the trail for a small lava cave. Next to the small cave is an impresive petroglyph of a honu (green sea turtle). Continue on the rough trail for 3/4 mile, pass a dirt road, and find the petroglyph preserve ringed by a fence and walkway. Stay outside the fence and view the rock art from the provided walkway. You might notice some other areas with rock art along the trail. It's fine to view them from a distance, but do not walk upon or touch them. Return the way you came.